Also known as “phthisis” or “consumption” (due to the wasting away of the infected individual) and “the white plague” (describing the pallor of the skin of those infected), tuberculosis was responsible for more deaths in industrialized countries in the 19th and early 20th century than any other cause. In the early 19th century, in fact, 25% of deaths in England were due to tuberculosis. Tuberculosis is caused by the organism Mycobacterium tuberculosis. A person with active tuberculosis sneezes, coughs, speaks or spits, emitting numerous tiny droplets containing the bacteria (a sneeze can release up to 40,000 droplets!). Transmission occurs when one or more of these bacteria-containing droplets are inhaled. Once in the lungs, the M. tuberculosis bacteria invades and replicates within cells. This leads to a response in which the body creates an organized aggregate of immune cells, called a granuloma, around this infected cell in order to contain the bacteria and concentrate an immune response to the area. After initial infection with M. tuberculosis, about 10% will develop TB pneumonia with infection spreading from the site of initial infection. The remaining 90% of people will remain asymptomatic and noninfectious, with the bacteria remaining dormant in the granuloma. In most individuals, the infection remains in this prolonged suppressed state called “latency”. However, in about 10% of infected individuals with latent disease, active tuberculosis will eventually develop, either due to a continuous process within a year or so of infection, or years later after a period of dormancy. Symptoms of fever, chills, night sweats, fatigue and loss of appetite develop along with chest pain, wheezing, persistent cough with sputum and the coughing up of blood (hemoptysis). As cells die within these areas of infection, a cheese-like proteinaceous mass of dead cells accumulates in cavities within the lung tissue. Back at L’Hopital, after finding Claire of impressive skill and knowledge as a healer, asked her to help tend the wounds of a boy with scrofula. Scrofula is a term used to describe the enlarged lymph nodes of the neck caused by infection with tuberculosis outside of the lungs, in this case in the area of the tonsils and adenoids. While tuberculosis primarily affects the lungs, in 15-25% of active infections, it spreads outside of the lungs and can occur anywhere in the body. Most commonly involved areas include the central nervous system (TB meningitis), lymphatic system (scrofula), genitourinary system, bones and joints (termed Pott’s disease when it is present in the spine). Tuberculosis has plagued humans for thousands of years. Evidence of tuberculosis infection has been found in Egyptian mummies, ancient China and India and in the writings of Hippocrates. A variety of treatments were applied prior to the era of antibiotics. In ancient Greece, patients were treated with healthy food, milk, and exercise. Some recommended eating wolf livers or elephant urine. Bloodletting was common. Later, TB sufferers were treated with various treatments with equally varied results such as carbolic acid, gold, arsenic, and cod liver oil. The 1880s brought the sanatoria movement or the “rest cure”, an attempt to cure TB and prevent its spread by moving patients in to quite environments, isolated from normal life, with freely circulating pure air. Surgical treatments became more common in the sanitariums, based on the theory that the part of the lung with TB needed to “rest” in order to heal. Surgeons would collapse the affected lung by way of various methods, to allow the lung to rest and heal. This would include causing a pneumothorax, perfuming plumbage (inserting air, oil, wax, etc., into the chest cavity to collapse all or part of the lung), removing ribs to collapse a lung, severing the phrenic nerve to paralyze half of the diaphragm to reduce the functioning of the affected lung. Vaccination against TB became available and widely used beginning in the 1940s and 50s in the form of the BCG vaccine (bacilli Calmette-Guerin, named for the two researchers who developed it in the 1920s and 1930s). The BCG vaccine does offer protection against TB meningitis and disseminated TB in children, but does not prevent primary infection or prevent reactivation of latent TB infection. While it does prevent some severe forms of TB in children, its impact is limited. 1946 marked the development of the antibiotic streptomycin, the first effective treatment for tuberculosis. The development of isoniazid would follow in the 1950s. Antibiotic treatment of TB was so effective that almost all of the sanatoriums closed permanently in the 1960s. Rates of TB infection dropped steadily until the 1980s, when they again started to rise. This has been attributed to the rise in HIV infection (patients with HIV have a much higher rate of developing active disease from a latent infection) and the emergence of multi-drug resistant TB. Because of drug resistance in TB, today the typical initial regimen for treating TB is four medications taken for 6 -9 months. TB can be cured when the regimen is followed but such a regimen leads to issues with compliance, perpetuating the problem. If a patient fails to complete the treatment or if the infecting bacteria is already immune to one of these antibiotics, some of the germs will survive, adapt and grow stronger, passing on drug-resistant traits as the bacteria reproduce. Thus, it is vital to eradicate the infection in its entirety with the first course of treatment. Extensively drug resistant TB (XDR-TB) has recently emerged, complicating treatment further. This is a rare type of drug resistant TB that is resistant to the two most potent TB drugs in addition to at least 2 other agents used in the treatment of TB. This is, of course, much more difficult to treat and cure has shown to be possible only in about 30-50% of patient with XDR-TB. TB remains a significant global health threat, particularly in developing countries. In 2014 alone, 9.6 million people developed TB infection and 1.5 million died from it. 95% of TB deaths occur in developing countries where it is among the top 5 causes of death for women aged 15-44. Challenges remain in developing fast-acting diagnostic TB tests that can also determine whether resistance is present (currently it can take 6-16 weeks to determine the resistance pattern of an infection), development of a more effective vaccine, and work to increase the reporting and treatment of TB. The stigma of tuberculosis remains a problem, leading to delay in seeking treatment and lower treatment compliance, allowing further spread of the disease. The field hospital at which I was stationed had been shelled three times. Even knowing that the flimsy walls of our temporary structures would not protect us, still doctors, nurses and orderlies had all dashed inside at the first alarm, huddling together for courage. Courage is in very short supply when there are mortar shells screaming overhead and bombs going off next door. Claire spent six years as a combat nurse in the second World War. In episode 209, the sights and sounds of men preparing for battle trigger terrifying flashbacks to her time in the war and she is seen reliving the trauma she has no doubt tucked away deep in her memory. As a combat nurse, she would have spent her days caring for soldiers suffering horrendous injuries as well as the more mundane, as we see with her flashback to her time educating soldiers about trench foot. She would be building relationships with the same men and women who would later be sick and seriously injured and in her care. She would have witnessed innumerable tragic deaths, while often fearing for her own life. When the war finally ends, Claire finds herself with only a brief time of peace and reunion with Frank before she is once again in harm’s way. Since her arrival in the 18th century, Claire has suffered what seems to be a lifetime of traumas in the form of war, violence, assault, arrest and imprisonment, narrow avoidance of execution, witnessing the torture of her husband, and the devastating death of her daughter. Claire holds deep within a long history of trauma. The psychological distress experienced by soldiers was first dubbed “shell shock” during World War I. Physicians used the term to describe the “dazed, disoriented state many soldiers experienced during combat or shortly thereafter.”(1) The condition was thought to be brought on by concussion and physiological damage caused by exploding artillery shells. However, military physicians noted that the same symptoms were seen in other soldiers who had not been in close proximity to exploding shells and opinion shifted, with many contending that shell shock was “a variety of cowardice or malingering” and those who “cracked” under the pressure of war were considered weak. Overall in WWII, 25% of US military casualties were caused by psychological war trauma. The rate was approached 50% for soldiers engaged in long, intense fighting. (2) Seeing that so many suffered these effects, despite already excluding over 1 million men in the screening process, opinion among most in the military began to shift to the acceptance that combat fatigue was not evidence of cowardice or pre-existing mental illness. 1,393,000 soldiers were treated for battle fatigue during WWII. Treatment was often focused on a few days of complete rest, with quick return to the front lines. 50-70% returned to combat within three days. Other treatment modalities included the administration of sodium pentathol (dubbed “truth serum”) to induce soldiers to “re-live their repressed battlefield experiences and thus reach a catharsis.”(2) Other physicians found that providing liquor during debriefings was beneficial to the troops. Some were treated with electric shock in an attempt to “jolt” the veteran out of his emotional turmoil. Others were treated with large doses of insulin which dropped their blood sugar severely and caused a comatose state. In the 1950s, some WWII veterans were even subjected to lobotomy, or surgical severing of the frontal lobes of the brain, in an attempt to relieve their psychological symptoms. Whether dubbed shell shock, psychoneurotic disorder, anxiety neurosis, character disorder, or combat exhaustion, very little was understood about what would come to be known Post Traumatic Stress Disorder. In 1980, after experience with troops returning from the Vietnam War, the American Psychiatric Association defined PTSD and published diagnostic criteria. Treatment today for PTSD includes cognitive-behavioral therapy, antidepressant medications, or a combination of both. Many resort to self-medication with drugs and alcohol to dull their crippling symptoms of PTSD, only to battle addiction as well. There is significant work to be done to fully understand how PTSD works, why it happens and what we needs to be done to prevent it and help these patients. Public awareness and understanding of PTSD and its effects is vital. Bravo to the Outlander team for this compelling depiction of PTSD, and in a female veteran no less! 1. Scott, WJ. “PTSD in DSM-III: A Case in the Politics of Diagnosis and Disease.” Social Problems. 37 (1990): 294-310. 3. Morey RA, Gold AL, et al. “Amygdala Volume Changes in Posttraumatic Stress Disorder in a Large Case-Controlled Veterans Group.” Arch Gen Psychiatry. 2012;69(11):1169-1178. 5. Sher L, Braquehais MD, Casa M. “Posttraumatic stress disorder, depression and suicide in veterans.” Cleveland Clinic Journal of Medicine. 2012. 79(2): 92-97. 6. “Office of Public and Intergovernmental Affairs.” News Releases. VA Office of Public and Intergovernmental Affairs, 1 Feb. 2013. Web. Retrieved from www.va.gov/opa/pressrel/pressrelease.cfm?id=2427. Do Claire’s actions as a healer change the future? To what degree? It seems that on a daily basis, Claire is impacting the lives of those around her, whether by providing antidotes to poisoning, avoiding epidemics, cleaning and treating wounds that would otherwise fester, or suggesting certain crops to avoid future starvation. Does each small change lead to larger consequences? Will the lives touched by Claire lead to ripples that magnify over time to cause significant future changes? Or is the future already written? Was Claire always destined to travel back in time and touch these lives? Does there exist some alternate future in which Claire Beauchamp Randall never travelled through the stones? A world where none of these people of the past would have had the opportunity to cross paths with Claire and therefore suffered death and disability she could have prevented? Fortunately, for the purposes of Outlander, we have been given The Gabaldon Theory of Time Travel in The Outlandish Companion! A time-traveler has free choice and individual power of action; however, he or she has no more power of action than is allowed by the traveler’s personal circumstances. Most notable historical events (those affecting large numbers of people and thus likely to be recorded) are the result of the collective actions of many people. Jamie: We know what will happen if the Jacobites lose the war. But what if they won? Claire: But…they don’t. It’s the verdict of history. Jamie: Have ye given up on changing the future then, Sassenach? Claire: After Paris? Haven’t you? Jamie: Aye, Paris was a bitter disappointment. But the future can be changed — you’ve proven it. Tammas Baxter lives because of you. Paris was spared an outbreak of smallpox because of you. Louise de Rohan will have the child of Prince Charles Stuart because of you. So many lives have been touched by Claire, starting in the first episode of season one, “Sassenach.” Had Claire not intervened and had left Jamie to the mercy of Rupert and Angus to reduce his dislocated shoulder by brute force, he could have been left with permanent nerve damage, deformity or weakness in his dominant arm. How would that impair his ability to wield a sword and defend himself? When young Tammas Baxter was dying from poisoning after mistaking lily of the valley for wood garlic at the Black Kirk, Claire saved his life with an antidote of belladonna. He now potentially will go on to grow into adulthood and have children of his own. Will his descendants go on to change history as we know it? How many lives were saved when Claire identified smallpox among the crew in La Havre and prevented an epidemic? To what degree do the dozens (hundreds?) of people she saved from smallpox go on to have a significant impact on the future? And what of the countless seemingly small actions Claire has taken with her patients such as care for wounds and mild ailments that could have become much more significant and potentially life-threatening without her intervention? According to The Gabaldon Theory of Time Travel, with free choice and individual power of action, Claire has changed the future of those she heals. However, these actions will likely not change notable historical events as those types of events would require the actions of many to take place. Considering all of the potential descendants of the lives saved, what are the odds that one of them may act independently to change history, whether via assassination of a significant figure or a groundbreaking discovery? 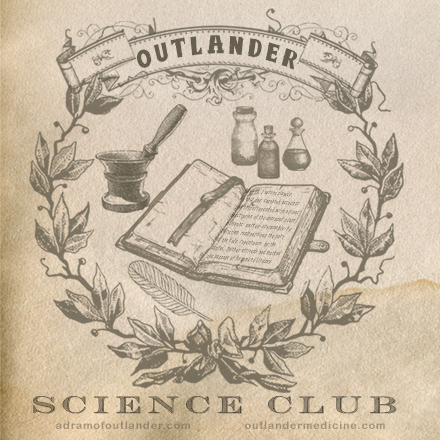 What will the future look like in a world where Claire Beauchamp Randall Fraser has had the opportunity to heal, cure, and prevent illness in so many? Fortunately, today brought the very exciting news that we will have another two seasons to consider this question as we see Voyager and Drums of Autumn brought to life on screen!